Training students of life science and technology to succeed on a global level. In the School of Life Science and Technology, students learn a wide range of specialized knowledge related to life science and technology and engage in world-class research and development. We aim to cultivate individuals with expertise in life science and engineering who can create new science and technology. In the Undergraduate Program, students learn the basics of science and technology in specialized courses covering life science-related biology, chemistry, and physics. In their fourth year, students make a start toward cutting-edge research as they engage in the Undergraduate Independent Research Project. The graduate school offers Graduate Majors in Life Science and Technology as well as Human Centered Science and Biomedical Engineering. In Life Science and Technology, students mainly take advanced courses in life science and conduct research. In Human Centered Science and Biomedical Engineering, students learn and conduct research by blending life science with the fields of chemistry, materials, machines, electrical and electronic engineering, information, etc. Students are encouraged to acquire internationally valued skills through study abroad at universities with cutting-edge knowledge and technologies in North America, Europe, and Asia or through internships at overseas companies. Why Study at the School of Life Science and Technology? Japan's largest education and research organization for Life Science and Technology. With a history at the frontier of Life Science and Technology spanning 20 years, we provide the largest life sciences Undergraduate Program and Graduate Program in Japan where students can broadly study life science and technology not only from a science and engineering viewpoint, but also from pharmacology, medical, and agricultural perspectives. Students can conduct research in areas from chemistry and physics to materials and information. At the School of Life Science and Technology, approximately 70 professors and associate professors perform cutting-edge research in a broad range of fields. The research fields relate not only to biology, but also extend to other scientific fields such as chemistry, physics, materials, information, etc. Broad and diverse studies lead to employment opportunities. Studies at the School of Life Science and Technology are connected not only with the scientific fields of biology, chemistry, physics, etc., but also with engineering fields such as applied chemistry, materials, machinery, information, etc., so graduates can set their sights on companies and research institutes in a variety of fields. The School of Life Science and Technology has the largest life sciences Undergraduate Degree and Graduate Program in Japan where students can broadly study life science and technology not only from a science and engineering viewpoint, but also from pharmacology, medical, and agricultural perspectives. At the School of Life Science and Technology, approximately 70 professors and associate professors perform cutting-edge research in a broad range of fields. The research fields relate not only to biology, but also extend to other scientific fields including chemistry, physics, materials, and information. 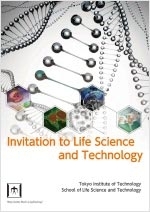 Studies at the School of Life Science and Technology are connected not only with the scientific fields of biology, chemistry, physics, etc., but also with engineering fields such as applied chemistry, materials, machinery, information, etc. By studying at the School of Life Science and Technology, students can find employment in a variety of fields. Many outstanding researchers visit from abroad, and participate in joint research and seminars. Each research laboratory is also home to many exchange students. The campus is an environment where students develop an international outlook and research skills. In recent years, it has become apparent that cancer cells are not the only harmful constituents of cancer tissues. Rather, there are a variety of cells that aid the malignant transformation and growth of cancer. In my research, I use cancer cells to uncover the mechanisms of how cells release molecular messages and how these messages affect other cells. The process of setting up a hypothesis and designing an experiment to test the hypothesis is both challenging and rewarding. I hope to acquire the skills to be able to uncover the development and progression of cancer. The abovementioned Department of Biotechnology, School of Bioscience and Biotechnology are student affiliations for those who entered in 2015 or earlier. For details on the education system in 2016 and onward, please see the following webpage . * Student numbers denote maximum student capacity of the department. * Number of Faculty is subject to change. Click below for the list of School of Life Science and Technology Faculty. Read, Learn and Have Fun!